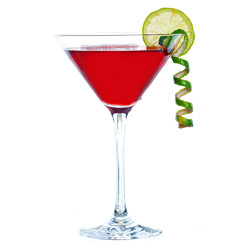 It is a cocktail drink made with white cranberry juice and vodka and has right amount of sweet and sour balance. 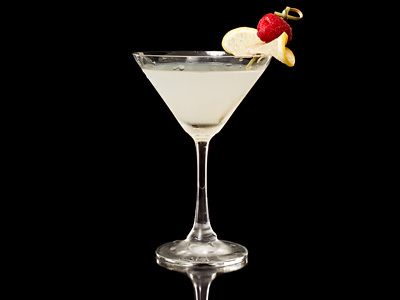 Follow this easy white cranberry martini recipe for making a perfect mixed alcoholic drink. Fill 2/3 of cocktail shaker with ice. Pour vodka, cranberry juice, simple syrup and lime juice over ice and give a quick shake. Skewer lime wheel and cranberry in cocktail pick and place it on the rim as garnish, serve. Make sure that serving glass is completely chilled before starting to make this cocktail. For more stronger martini, use vodka and white cranberry juice in equal parts. It is recommended to use pre-chilled ingredients. Add 15 ml (1/2 oz) orange liqueur like cointreau or triple-sec for extra citrus flavor. Use cucumber vodka for different taste. Taste: Drink with crisp, subtle flavor and gentle kick. Serving Ideas: Enjoy it on romantic dinner. It is generally served during cold wintery season as pre-dinner drink or after dinner dessert cocktail.